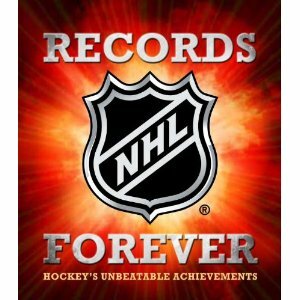 With it's fiery cover and colorful, action packed, photo intense content, the NHL and author Andrew Podnieks had those popular Guinness Record and Ripley's Believe It or Not books in mind when they put out NHL Records Forever: Hockey's Unbeatable Achievements . This book celebrates many of the NHL''s most amazing stats, records and achievements. Think Hockey Guide and Record Book (though less comprehensive) with a much more contemporary design and loads of incredible hockey photographs. In many ways Records Forever is very much a tribute to the game and to the all time greats. Every vibrant page enthusiastically covers each achievement and explaining why it will never be equalled. In total 50 of hockey's greatest achievements are celebrated. Though perhaps aimed for a bit of a younger audience, the content can be enjoyed by any hockey fan. It is a great way to reminisce or learn about the great game of hockey!